‘Even on a smiling spring day, the place seems haunted and, in a way that is hard to explain, corrupted. L.A Carlyon. ‘Gallipoli’. Bantam Books, 2001. Welcome to my rebuilt and relaunched site about Gully Ravine. If this World War One location on the Gallipoli peninsula in Western Turkey is not familiar to you, please see the introduction below. Where is Gallipoli? Google map. I have been fortunate to have been contacted by a number of enthusiastic and skilled researchers in recent months, and this has led to some great progress on two issues that had intrigued me for some time. These are the namings of ‘Point P’ and ‘Jennett Road’ trench on Gully Spur. Many thanks to Len Barnett and to Noel Forde respectively. . If you are interested in a private or group tour to the Gallipoli peninsula, either at an introductory or ‘off piste’ level, please contact me. International Guild of Battlefield Guides, badge number 66. 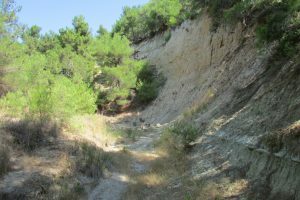 Gully Ravine is an ancient four kilometre long water course on the north side of the Gallipoli Peninsula in Western Turkey. It lies in the Helles sector of Gallipoli, where British, Commonwealth and French were the predominant allied forces present in 1915. This site is quite specifically about Gully Ravine and its environs. There are many excellent sources for the more general background on the Gallipoli campaign. See the Gallipoli Association site. If you have an interest in Gallipoli I do recommend membership. In the early stages of World War One, the Gallipoli peninsula was the scene of fierce trench warfare and of huge losses on the part of both the allied and the Ottoman forces. (See the site use notes concerning the use of ‘Ottoman’ and ‘Turkish’). The Landings at Cape Helles and at the location which became known as ‘Anzac’ on the Gallipoli Peninsula were ordered when the planned naval push through the Dardanelles straits to Constantinople (modern Istanbul) in February and March 1915, intended to relieve the blockade against the Russian allies and open a second front, was thwarted by shore-based fire and mines. It was agreed to land men to overrun the Turkish defences, and this initial step led to an nine month campaign from late April 1915 to early January 1916, when the Allied troops were evacuated. Official figures suggest that almost one million Allied and Turkish soldiers were mobilised during the campaign, and that both sides suffered casualties (killed, wounded or missing) of some 250,000 each. Gully Ravine, known to the defending Turkish forces as Zighin Dere, runs in a south westward direction down to the sea from the foothills of Achi Baba, a modest hill which, very optimistically, was the objective of the allied forces for 26th April 1915, the day after the landings at the beaches on the western end of the peninsula. Achi Baba was never taken by the allies. There are a number of water courses that run westward towards the sea in this way, but most are just a few metres deep. Thousands of years of erosion have made Gully Ravine up to 30 metres deep in places. Allied attacks on the spurs to the west and east of the ravine and the resulting trench systems made the gully an essential access route for the front lines, and also itself the scene of direct and bitter fighting. The final allied front line prior to evacuation had progressed a considerably way up the gully, to its division with The Nullah at Fusiliers Bluff, about a kilometre from the village of Krithia, modern Alcitepe. However, the village and the very head of the gully were defended successfully but at huge cost by the Ottoman army. Another feature that made Gully Ravine such a focus of activity is that it is far more than simply a sunken stream bed. Smaller gullies and openings run off it on either side, and these were quickly pressed into use as dressing stations, supply dumps, dormitories, practice firing ranges and stables etc. 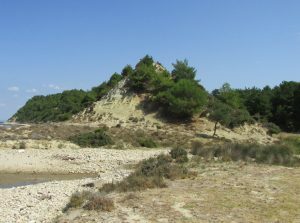 From the first occasion that I heard of Gully Ravine, I have been drawn to its history and place in the Gallipoli campaign. The gully is a microcosm of all that trench warfare was – both in terms of the horror of fighting and death, the stalemate of attack and retreat, and also the building – in truly awful circumstances, of a ‘home from home’. It is also a relatively unknown part of the Gallipoli campaign. Thousands visit the Anzac area and the main British landing beaches every year, but the deeper parts of Gully Ravine lie untouched and unfrequented, except by a few with specialist – or personal – interest. I first visited the Gallipoli peninsula in 2002, but only realised my ambition of walking through Gully Ravine and exploring the associated spurs in late 2007. This modest site attempts to record my ongoing experiences of this remarkable and hauntingly tragic location. It is a truly strange and unusual place to visit. I have two, albeit distant relatives listed on the Helles memorial, and based on their regiments and the dates they fell, it appears that they were involved in the fighting in and around the ravine. One fell on 28th June 1915 at the height of the Battle of Gully Ravine in the area of the Boomerang, and the other in August, having just left the firing line on Gully Spur. Research continues. If you would like to contribute to this site or make an enquiry, then do please email me.